I thank you for the support that helped us to rebuild the honey bee numbers after the collapse from pesticides. We purchased ten full new hives of bees, and boxes for splits and nucleus hives. Over 500 frames and wax were purchased to replace all that had to be destroyed and to fill the new honey supers (boxes where the bees store honey). Two new large freezers were also purchased for storage, as studies have shown that freezing honey keeps it from crystalizing and there are no changes in colour or flavour. I purchased queen bees from a Canadian breeder with very high hygienic test scores so we will see how they overwinter and build up this year. In 2013 the bees produced approx. 500kg of honey that could be sold. The purchases you helped me to make allowed me to split some full hives and start nucleus boxes throughout the summer. This means I have gone from 20 to 48 hives and produced 820kg of honey to be sold. I realize that 820kg, after more than doubling the amount of hives, does not seem like a lot of honey, however when you keep taking brood (baby bees and larvae) out of full hives to make nucs they can not bring in as much nectar for honey and I leave a full box of honey on each hive for their winter food. In 2015 we should see a large increase in honey production, as there will be a lot more full hives and not as many splits or nucs to be made up. 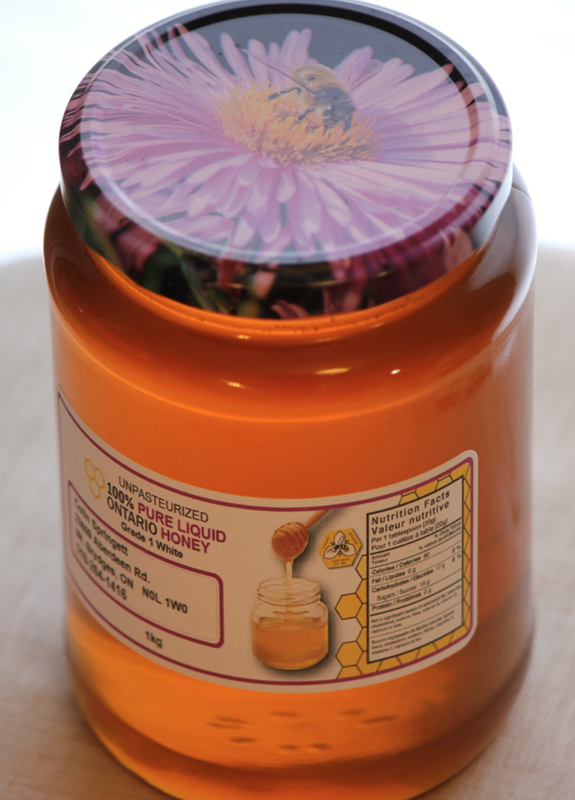 As always our emphasis is on bee health and the quality of the honey. This winter a new website is being created along with new labels for our jars and we have added the Organic Works Bakery and Sunshine Bakery to our list of customers. Our orders have increased substantially because of an excellent response to the taste and quality of our honey. I will keep you posted on how we fared through the winter and what is produced this summer. Your assistance in helping us rebuild is greatly appreciated.